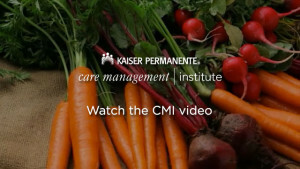 The Care Management Institute (CMI) supports Kaiser Permanente clinicians to continually improve care by identifying and spreading leading clinical and operational practices, designing integrated care delivery models with stakeholders across the organization, and supporting the national program through partnerships with providers, staff, clinical experts, leaders, patients, and families. We have a very unique and integrated way of working which aids in our ability to elevate and spread leading practices, drawing from the collective knowledge of multiple stakeholders. Formed in 1997 and co-sponsored by the Permanente Medical Groups and Kaiser Foundation Health Plan, CMI strives to ‘make the right thing easy to do’ throughout Kaiser Permanente and beyond.